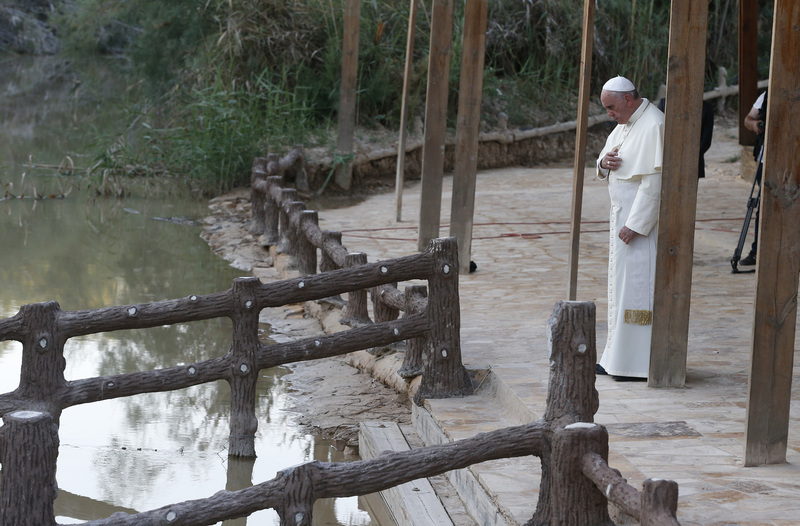 Jordan's powerful and marginalized joined together at the banks of the River Jordan to welcome Pope Francis at the site believed to be where Jesus was baptized. Jordan's King Abdullah II, his wife, Queen Rania, and Prince Ghazi bin Muhammad bin Talal, the monarch's personal representative and special adviser on religious matters, welcomed the pontiff to a very intimate setting of reflection, followed by testimonials of courage in the face of life's difficulties. Pope Francis brought his trademark human touch to those suffering -- the marginalized in society -- as he visited the sacred place. There, near the banks of the River Jordan he prayed, spoke and blessed Syrian and Iraqi refugees sheltering in Jordan, along with Jordanian orphans, the sick, and the disabled who shared their stories. Young Jordanian orphans tenderly sang the cherished song of St. Francis of Assisi, "Make Me A Channel of Your Peace," and more hymns followed: "Welcome, Welcome, to Pope Francis, to His Holiness," the exuberant crowd belted out in Arabic. The pope signed a welcome book, his message reading, "I ask the all-powerful and merciful God to teach us all to walk in his presence with our souls and feet uncovered and our hearts open to divine mercy and love for our brothers and sisters. In that way, God will be all in all and peace will reign. Thank you for offering humanity this place of witness. Francis. 24.5.2014." In a papal address, Pope Francis hit hard on those who perpetrate and perpetuate wars, instead saying that peace must be pursued particularly in the troubled Middle East region. "Arms are the main reason for the war. ... We pray for those making and selling arms, that compassion fill their hearts," he said. "May God change the hearts of the violent and those who seek war and those who make and sell arms. And may he strengthen the hearts and minds of peacemakers and grant them every blessing," the pope said. He singled out Syria, in desperate need of healing and peace. "Jesus' humility never fails to move us, the fact that he bends down to wounded humanity in order to heal us," he told the packed Catholic church in Bethany Beyond the Jordan. "We are profoundly affected by the tragedies and suffering of our times, particularly those caused by ongoing conflicts in the Middle East. I think particularly of Syria, rent by nearly three years of civil strife, which has led to countless deaths and forced millions to flee and seek exile in other countries," he said. A young Syrian refugee in the audience told Catholic News Service of his trials back home and in Jordan. "My brother and I fled because of the dangers of kidnapping and killing of Christians in northern Syria," said the 33-year-old man named Moussa. "Christians are perceived to have money, and that's why they are kidnapped by militants." "On top of that, there are many difficulties just living in Syria at this time. There is no work, prices have shot up. There is no water and electricity available. Actually there is nothing," the part-time university student/salesman said. "I want the pope to pray for us, for peace in Syria and for the war to end," he said. "(Pope Francis) said before that he doesn't want Christians to leave the Middle East. But if you stay here, maybe some people will be killed and others face great difficulties, so what do we do?" the refugee asked. The pope also urged the international community to help Jordan bear the economic burden posed by hosting more than 1 million Syrians -- 600,000 registered with the U.N. refugee agency -- and 300,000 Iraqis still sheltering in the country. The pope listened to stories of courage by the sick and disabled gathered at the Baptismal Site and gathered many in his arms. Zaina Haddad, 19, told the pope how her faith in Christ helped her overcome cancer. "I had faith I would get through this, I know that God ordained the time of my sickness and that Jesus gave me this time to be in solidarity with him," the young Jordanian woman said. "I finished my high school exams, I knew that God stood with me, and that he would not leave me," she added, embracing the pope and placing around his neck a traditional red and white checkered scarf with the papal visit emblazoned on the material.